We are going to pick you up from your hotel early in the morning by our vehicles to our Office in Göreme.We will offer you some coffee, tea and appetizer foods. Also we will do your check-inAnd then you will watch preparing balloons at the take-off area.Preparations normally takes 15-20 minutes.Our flights begining with the sunrise.Our pilots will climb until 3000 feets from ground level to show you beauty of Cappadocia. Also they can flight 1 meter close to the rocks as well to takes nice pictures and for fun.Standard Flight takes 60 minutes.We are using 14-20 persons basket for Standard Flights.There will be champagne celebration end of the flight.We will offer you Flight Certificate signed by the pilot to remind this experince to you.After all, we will drop you to your hotels back. We are going to pick you up from your hotel early in the morning by our vehicles to our Office in Göreme.We will offer you some coffee, tea and appetizer foods. Also we will do your check-inWe guarantee you to see at least 3 valley and take-off area will be according to wind direction and speed.Our pilots visiting Cappadocia to check wind direction and speed for decide a true take-off area.After Pilots deciding to take-off area, we are going there to watch preparing our balloons and if you likes you can help crew.Preparations normally takes 15-20 minutes.Our flights begining with the sunrise.Our pilots will climb until 3000 feets from ground level to show you beauty of Cappadocia. Also they can flight 1 meter close to the rocks as well to takes nice pictures and for fun.Deluxe Long Flight takes 90 minutes.We are using 6-8-12 persons basket for Deluxe Long Flights.There will be champagne celebration end of the flight.We will offer you Flight Certificate signed by the pilot and Cappadocia Balloons Tours Pin to remind this experince to you.After all, we will drop you to your hotels back. - Transfers to / from your accommodation. -Open buffet breakfast, coffee/tea and snacks before take off. - All our passengers are insured up to 1.000.000 EUR. - A commemorative flight certificate. 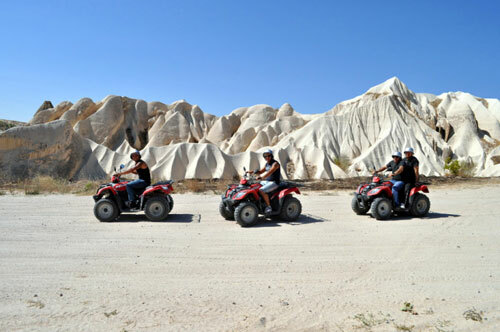 You can drive a ATV (quad) bike on your own and our guide will lead you to see the most attractive and spectacular rock-cut valleys of Cappadocia. You will have a chance to have a different and memorable sightseeing experience, as you will drive between those different hills, beautiful valleys and dunes with your friends. Our guided ATV Tours range from 2- to 8- hour tours. We truly cater to riders of all levels. Many of our customers have never been on a horse before. Pretty much none of these first-timers say they will never get on a horse again after their experience here. We take pride in offering a safe riding environment with well-trained horses and experienced guides. Regardless of your level of riding, we will provide an unforgettable experience to augment your stay in the Cappadocia region. In folk music and dances we find powerful reflections of the human experience over thousands of the years, expressed with a passion unmatched elsewhere, In an underground restaurant you can test Cappadocia wine, join the dance and enjoy your night time in Cappadocia. The branch of Sufic mysticism practiced widely in contemporary Turkey is rooted in a man called Mevlana Jalaluddin Rumi, and is famous for its Whirling Dervish Tradition, where through rotating on the left foot by crossing over it with the right, the Dervish reaches a spinning intensity, rotating to the music that musicians play close by. As we observe them them revolve with their necks out and their head leaning to the side, we sense that they are in love with their way of life. Sufism is apart from the Islamic religion because of its nature as a kind of transcendental metaphysics which accepts all religions as one and is founded upon universal and unconditional forgiveness. 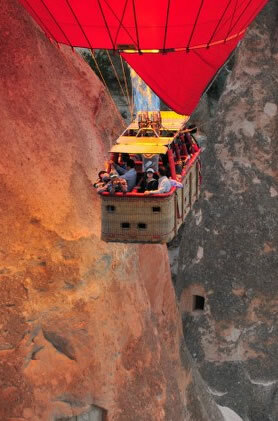 Idea: This tour gives the story of Sufism and their communities in Cappadocia, Turkey, today.You will meet the Sufi community and their monastery.You will listen to their music.You will eye-witness the Whirling Dervishes Ceremony in Cappadocia. This ceremony is presented every day at the historical Selcuk Caravaserai (12 century). Each day in Cappadocia there is a ceremony of the whirling dervishes. Thermal Spa Hotels program Ziga Thermal , a town renowned for its natural spas and thermal water. The hot waters of Ziga thermal springs are composed of a mixture of many minerals and contain a high level of calcium, sodium, chlorine ions and hydrocarbon ioans. They are said to be efficacious in the treatment of rheumatism, metabolism disorders, skin conditions, eyesight problems and many other problems.You will check into your Thermal Spa Hotel where you can enjoy the facilities including inside and outside pools, Turkish baths, saunas and hot tubs; massage services can also be provided. Dinner and relaxation in your Thermal Spa Hotel. Overnight in Thermal Spa Hotels, if you want.